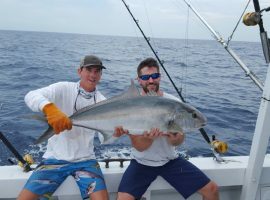 When it comes to finding the best fishing in the country, few other spots match the level of fun and the variety of fish like that of Key West. At Captain Moe’s Lucky Fleet, we bring all manner of customers out on the ocean for a good time. It doesn’t matter if you’ve been out on the water with a reel in your hand one-hundred times or if this is your first trip out. Our expert captain and crew members will offer advice, experience, and a few stories to help pass the time on the water. By the end of the day, you’ll have bagged something good. Our tarpon fishing charters in Key West are the best around for a reason! Tarpon fishing is one the specialties here at Captain Moe’s Lucky Fleet. We love tracking the local fish down alongside newcomers and battling it out. Tarpon fishing charters in Key West have become immensely popular in recent years. In fact, they’re a major attraction for tourists visiting the region. At Captain Moe’s Lucky Fleet, we bring charters out between April and June to catch a record-setting number of tarpon. Due to migration patterns, hundreds of thousands of tarpons will be available throughout the waters of Key West during this period. The current state record tarpon weighs 243 lbs, caught by Gus Bell just off of Key West way back in 1975. That record has yet to be broken. Who knows? You could very well be the fishermen to break the state record and gain a little fame. There is only one surefire way to break that record, though. You have to hop a charter with Captain Moe and head out to sea! Contact Us for the Best Tarpon Fishing Charters Key West Has Available! For tarpon fishing charters in Key West, contact Captain Moe’s Lucky Fleet by calling 305-304-8065. Whether you’re a newcomer or an experienced veteran, you’ll have the time of your life with our crew!